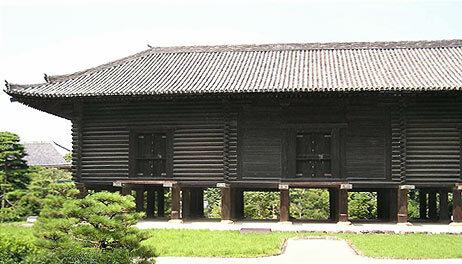 A storage facility constructed of logs *azegi 校木, cut in appropriate lengths to be piled up horizontally to make the walls. Best known are those with the logs cut in triangular shape and chamfers made along each angle. Sometimes the logs are circular or square. The logs are laid so that they interlock with each other at the corners. There are no corner pillars. The flat side always faces inward to make a smooth wall, while the diagonally cut parts face outward making a 'saw tooth' pattern. Most azekura are relatively small, having only one storage area; however, the *Shousouin 正倉院 at Toudaiji 東大寺 in Nara, the oldest extant and the largest such structure, is composed of two azekura storage facilities connected by a center section enclosed with planks. Most azekura have roofs with double beam and strut construction *nijuubari 二重梁. Because of its large dimensions, the Shousouin originally had a triple beam roof framework. (now replaced by a Western style truss). The roof of the Toudaiji sutra repository has a framework of diagonal braces with center struts *sasu 扠首. Storehouses usually have hip roofs *yosemune-zukuri 寄棟造. Storehouses with rounded logs are called marukikura 丸木倉 and those made of heavy timber planks, atsu-ita 厚板, are called itakura 板倉. The term kousou 甲倉, meaning a 'first-class storehouse' was used in ancient times. From the Heian period to the 13c, the characters 校倉 were used, but later azekura was written 叉倉.